There is a total of 118 discovered elements. These elements differ from each other because of the atoms which constitute them. They have the different number of protons in their nucleus. Although, these elements differ from each other but they share some of the common properties with each other. Chemists study these properties and have classified the elements in a table according to their properties. This table is called periodic table. How are elements organized in the Periodic table? The Periodic table of elements is divided into columns and rows. Each Block of the periodic table represents a single element. Elements are organized according to their atomic number in such a way that the atomic number increase from left to right in each row. The rows of the periodic table are called periods and columns are called groups. The periodic table has 18 groups and 7 periods. A group is also called a family of elements. Elements in each column have the same number of valence electrons (outermost electrons). For example, Sodium and Potassium are in the group I, so they both have one valence electrons. Groups also show how an element will behave. For example, the last group is the noble gas family (Helium and Fluorine etc.). The elements in the noble gas family have their valence shell complete, so they don’t react with other elements in normal conditions. 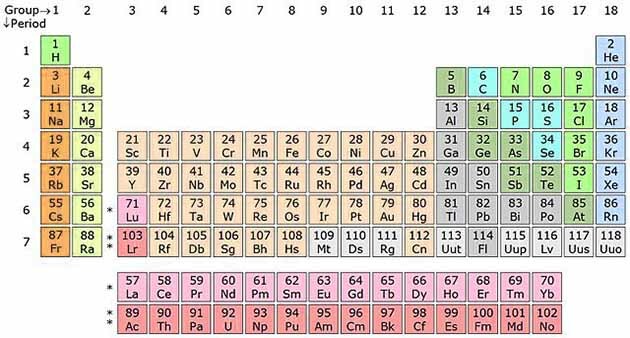 The periodic table has 7 periods, these are the horizontal rows. The atomic number of elements increase from left to right of the periods. With increasing atomic number their atomic radius also increases. J is the only letter which is not available in the periodic table. Because no any element is abbreviated with J. The first group of elements is called Alkali metals family. Elements in this category are very reactive which includes sodium and potassium. Hydrogen is not considered as the part of Group I elements. Because it resembles with multiple groups. Oxygen is the most abundant element in the Earth’s crust. Abdul Wahab, "Periodic Table," in Science4Fun, April 13, 2019, http://science4fun.info/periodic-table/.